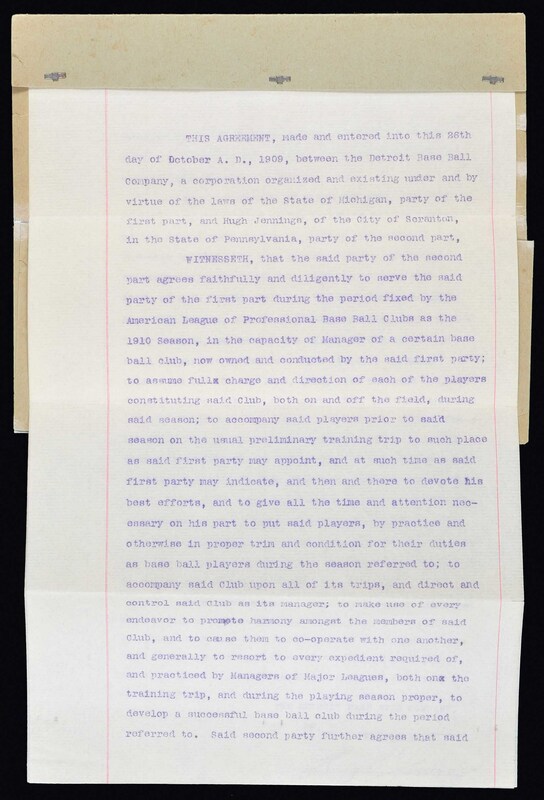 Two-page managerial contract between Hugh Jennings and the Detroit Baseball Company, dated October 26, 1909, signed in black fountain pen by "Hugh Jennings" (grading "9"). 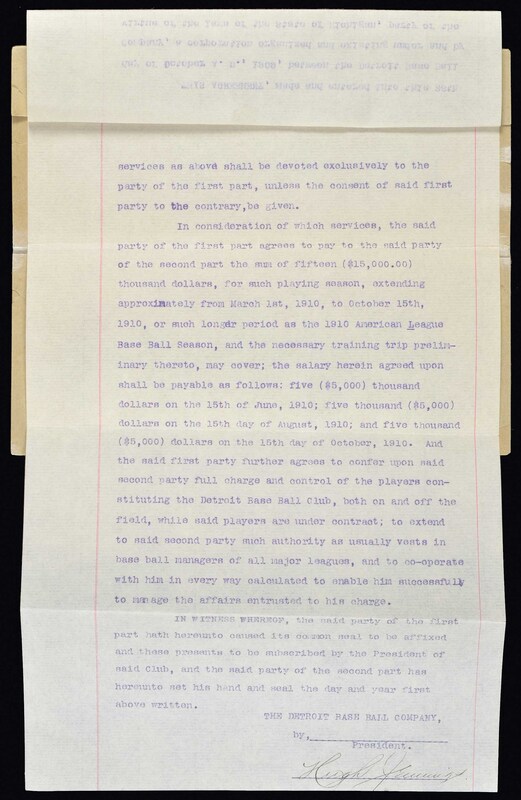 The contract, for the 1910 season, calls for Jennings to receive a salary of $15,000 payable in three installments of $5,000 each over the course of the season. One of the stars of the fabled Baltimore Orioles during the 1890s, Jennings took over as manager of the Tigers in 1907. Whether it was Jennings' acumen as a field general or the arrival of a hard hitting outfielder from Georgia by the name of Cobb, one cannot say for sure, but the Tigers proceeded to win three consecutive pennants from 1907 to 1909. Obviously, as one can see here, Jennings was well rewarded for the club's success over that time period (Cobb only made $9,000 in 1910). Unfortunately, those three seasons mark the high point of Jennings' managerial career, as he never won another pennant with the club over the course of the next 11 seasons. As most collectors are aware, Jennings' signature is among the most elusive of all prewar Hall of Famers because he died in 1928 at the age of 58 from tuberculosis and wasn't elected to the Hall of Fame until 1945. Of the small number of Jennings signatures in the hobby today, most are found on team-signed New York Giants balls from the 1920s. His signature on a document such as this is not only exceedingly rare, but highly prized by collectors. This is only the third Hughie Jennings signature example on a flat that we have offered since 2004, and we have seen fewer than five others at auction during that time. It is also the only Hughie Jennings contract, player or managerial, that we have ever seen. The contract (13 x 8 inches) displays three horizontal folds and is in Excellent to Mint condition. It is attached (by means of three staples at the top, to its original paper docket bearing the name of the legal firm "Navin, Sheahan, & Bourke (Frank Navin owned the Detroit Tigers). The docket is missing one of its four folded sections and one of the remaining sections displays a tear along the fold line that has been professionally repaired, but is still partially detached. Full LOA from PSA/DNA. Pre-certified by Steve Grad and Brian Sobrero/Beckett Authentication Services. Auction LOA from James Spence/JSA. Reserve $2,500. Estimate (open).